With its natural magnesium content, Magnesia brings more than just a brilliant refreshing feeling. We support Czech culture by awarding the best Czech actors, films, and books! 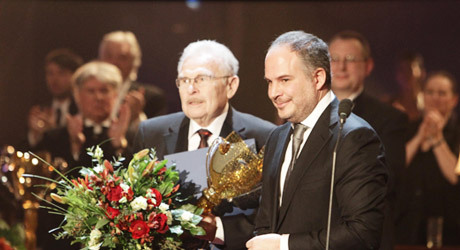 Since 2002, we have been collaborating with the Czech Film Academy on recognizing and rewarding the best motion picture achievements of the year as the general partner of the Czech Lion film awards. You can learn more about the best Czech films at www.ceskylev.cz. We help students get on the red carpet! As a part of the Czech Lion film awards, Magnesia awards a special prize to the best student films. We want to support young authors, motivate them in their future work and help bring to this world a new generation of Czech filmmakers. We stood at the birth of the annual Magnesia Litera book reviewers’ and readers’ choice awards. And we continue to select the best books in ten categories, including the highly regarded Book of the Year category. You can learn more about the best Czech books at www.magnesia-litera.cz. We are also the general partner of the Czech Actors’ Association Thalie Awards that are presented annually in recognition of outstanding achievements in drama, opera, ballet, musical, or dance and drama genres. You can learn more about the best Czech artists at www.ceny-thalie.cz.